Sadly, Scarlet’s story is one we hear far too often. She was purchased as a pet before being surrendered to The Wildcat Sanctuary. 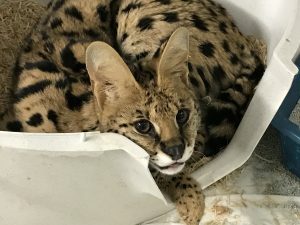 Owning a serval is illegal in this state. We were first told that Scarlet had been spayed and front paw declawed. 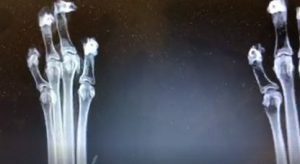 But her intake exam showed she’d been 4-paw declawed with complications visible from that. Scarlet also was not spayed. 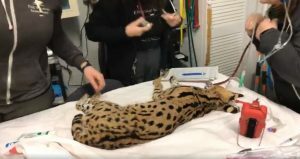 She also told us her appetite had decreased with no bowel movements, so we feared a bowel obstruction as we see with so many wild cats kept in homes. They tend to eat many things that can cause obstructions. We were very concerned about her needing immediate medical attention, so our caretakers drove 2 ½ hours to pick her up. She traveled in a crate very calmly back to the sanctuary where our vet and hospital manager were waiting to do a thorough intake exam on her. If emergency surgery was necessary, we were ready. Thankfully, her bowel didn’t show a visible obstruction. But what else we found is heartbreaking. She has a plate in a previously fractured left femur. She also has metabolic bone disease and anemia. We’ve dealt with metabolic bone disease before. Both cougars Andre and Liberty arrived with that condition. Metabolic bone disease happens during critical times of growth at a young age. Scarlet didn’t get the proper nutrition she needed for her bones to grow properly. Her rib cage has fractures that have since fused, but it may limit how much she can expand her lungs. Heavy running, climbing or jumping could be a problem for her. We can’t reverse the damage done in her young life. But she’ll get top notch care here, thanks to our hospital manager who has a PhD in nutrition and our knowledgeable caretakers. She’ll receive supplements for her anemia and the metabolic bone disease. Scarlet will have some hurdles and limitations but she should be able to live out her life happily, with proper care. Owning a serval is illegal in the state of Minnesota. But, as you can see, breeders will still sell to anyone, no matter if it’s legal or not. Scarlet had been taken from her mother wherever she was bred and passed along from person to person to person. How sad for this little girl that life started this way. But things will be better now. 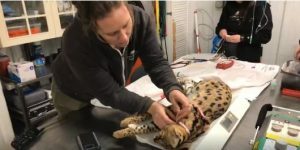 She’ll move out into a habitat of her own soon and we hope to introduce her to other servals so she can grow up as she should – wild at heart. Thank you for donating to keep our rescue fund full. It’s times like this, when we have to drop everything to go on an emergency rescue, that reinforce how grateful we are to have you as part of our rescue team.